D.A. 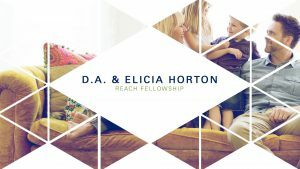 and Elicia Horton speak on family, home, marriage, and the Good Life. DA Horton, Pastor of Reach Fellowship in Long Beach, CA preaches on how the reality of what we are called to do is to love our Lord, and show Him that we love Him with as many expressions of love as possible in the first session of the 2018 GO Conference. Danny Akin, President of Southeastern Baptist Theological Seminary preaches on how we should love the Word of God because it is divinely inspired in the second session of the 2018 GO Conference. 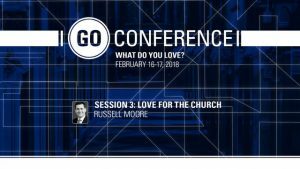 Russell Moore, President of the Ethics and Religious Liberties Commission preaches on how we love the Church because we love Jesus in session three of the 2018 GO Conference. Tony Merida, Pastor of Imago Dei Church in Raleigh, NC preaches on how the love of Christ keeps us from being self-serving and self-centered in session four of the 2018 GO Conference. 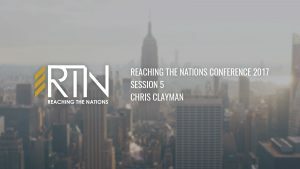 Chris Clayman preaches during the fifth session at Reaching the Nations 2017 at Southeastern Seminary. *End of video was omitted due to power failure. 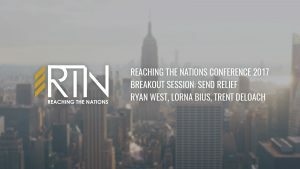 Ryan West, Lorna Bius, and Trent DeLoach share during the Breakout Session: Send Relief at Reaching The Nations 2017 at Southeastern Seminary. Terry Sharp preaches during the Breakout Session: Reaching the Nations from Where You Are at Reaching The Nations 2017 at Southeastern Seminary. Bryant Wright preaches during the fourth session at Reaching The Nations 2017 at Southeastern Seminary.